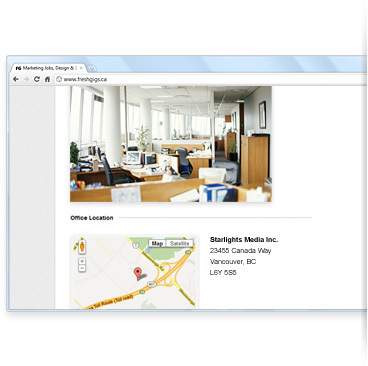 FreshGigs.ca is the leading jobsite specializing in marketing, communications and design jobs in Canada. Since our start in 2010, hundreds of employers in a wide-range of industries have used FreshGigs.ca to save time and reach more candidates with the skills and experience they are looking for. Over 60,000 job seeking professionals visit our jobsite each month, and jobs are promoted through social media, our partner network, and in our member newsletter. We advertised on 3 different job sites, and yours was by far the most user friendly experience! It involved the least amount of steps, the customer service was amazing and we have already had applications come in as a result of your site...the quality of candidates have surpassed the other sites. We received excellent quality responses to our employment opportunity on FreshGigs.ca. The site is easy to use and is integrated with popular social media platforms. Plus we appreciate the great personal service! I'm impressed with the quality of the candidates and service provided by FreshGigs.ca; I won't hesitate to do business with them in the future! 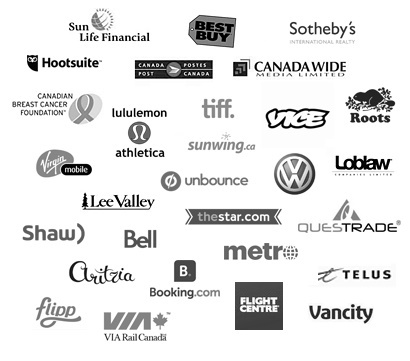 Through our partner network, every job posted on FreshGigs.ca appears on top marketing, design and industry association websites and blogs, putting your job in front of tens-of-thousands of active and passive candidates. No longer will anyone need to wonder where your office is located. By simply entering your office address an interactive Google Map will be added to your job posting. Now candidates can see exactly where the office is located and figure out how they can best commute ahead of time. Share your culture. Upload photos of your company's office and work environment, staff, events and anything else that will help qualified candidates get a better sense of your company's culture and brand. If you are planning on posting more than one job you will enjoy the convenience and cost savings that come with job packs. This can save you hundreds, even thousands of dollars, on your recruiting costs. Plus, credits never expire. We are happy to offer non-profit organizations a discount on all job postings. If you are a non-profit organization please contact us to receive a discount. Hundreds of employers can't be wrong. With all you get by posting your job on FreshGigs.ca, you really have nothing to lose by posting your job today.